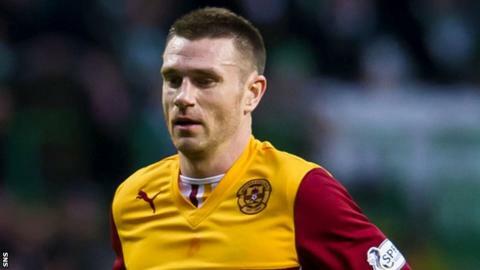 Motherwell defender Stephen McManus has described agreeing a new two-year deal as a "no brainer". The former Celtic captain, 31, has impressed for the Steelmen since his move from Middlesbrough last summer. "Last season couldn't have gone any better for me personally," McManus told his club website. "I wanted to come here at the start of last season, play as many games as possible and, hopefully, bring something to the team." The defender, who has 26 caps, added: "I've really enjoyed it and the decision to extend really was a no brainer." 'Well boss Stuart McCall praised the impact McManus had made in his 42 appearances for the club. "On the pitch, Stephen is a rock for us at the heart of the defence as well as a real influence in the dressing room and around the club," added McCall. "He played more than anyone at the club last season, missing just one game, so we're thrilled he has extended his stay. "We hope to be in a position to confirm new deals for other players in the very near future too, with preparations for next season already well under way." McManus moved to Boro from Celtic for £1.5m in July 2010 after 12 years with the Glasgow club.